It's June bug season. Here's what you need to know. Scientists have no explanation for the June bug's manic attraction to electric lights. Researchers do know this: late May and early June is mating season. The June bugs have just weeks to reproduce. Then they die. You'd be frantic too. The white, grub-like larva of the June bug lives in soil for up to three years. They love nice green lawns, especially yours. Thousands of those grubs are gnawing on the roots of your grass right now. These notoriously lame flyers actually have two sets of wings. Only one of those pairs provides what scientists call lift. Given their manic attraction to light (see Fact #1), June bugs quickly exhaust themselves. Then they collapse on your porch, belly up, for you to be freaked out by them. 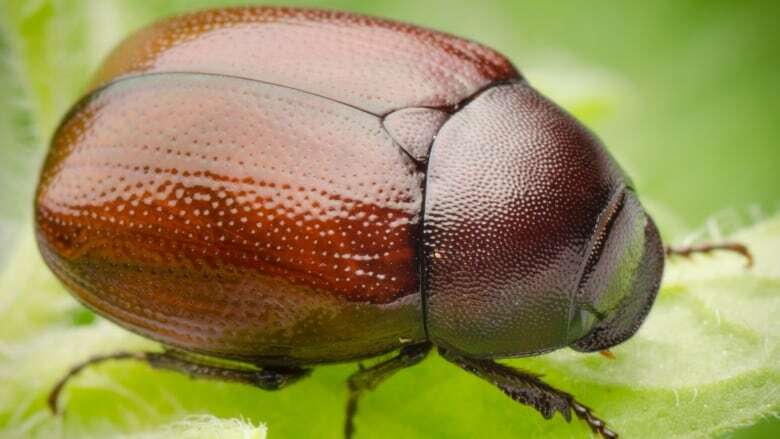 June bugs that crash to the ground become an important source of food for birds and mammals. That includes crows, blue jays, skunks and raccoons. June bugs are members of the vast and diverse group of insects we call beetles. Beetles have been around 230 million years. That's, like, older than the dinosaurs. They're prolific, too. One in four of all animals now living is a beetle. Take that, dumb light bulb.